My Printable Bible verses worksheets are perfect for children who are working on basic handwriting skills. They are simply to help improve your Child’s handwriting with practice, but they also help to introduce your child to the word of God and reinforce the values found in the Great Book! A gentle answer turns anger away. But mean words stir up anger. Handwriting is such a big deal… it takes continuous practice to improve letter formation and make your writing legible. 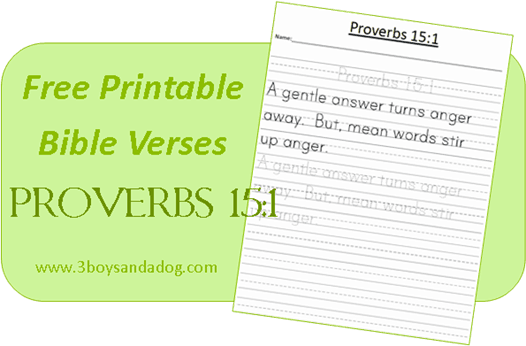 You can also access all of the free printable bible verses resources here at 3 Boys and a Dog! Looking for more fun items to help you in teaching your kids about the Bible? Check out my top picks from Amazon!